It is 1957 in Brighton (still). Steine, Brunswick, Twitten and Mrs Groynes have managed to reach land after being set adrift in an open boat by the villainous Mrs Adelaide Vine. But what more can she be planning? Into all their lives limps a hero, the modest but oh-so-charismatic Captain Hoagland, a bomb-disposal hero from the Second World War. “Damn this leg,” he says. Also, “Damn this wrist”, “Damn this hip” and “Damn this elbow”. Captain Hoagland is played by Robert Bathurst. Personally, I think it’s the best series. John Ramm, Mike Fenton-Stevens, Matt Green and Samantha Spiro are all brilliant in it. 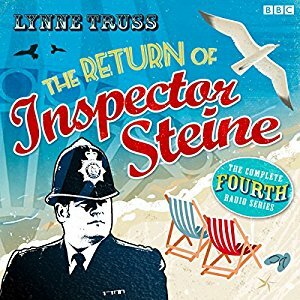 This series is not yet available from AudioGo, but as of Spring 2012 we do hear they intend to release it as downloads (hooray).